Courtesy photo Taking part in recognizing Altoona Area High School Commended Students are (from left): Andrew Neely, AAHS principal; Devyn Freet; Rachel Krier; Regan Baker; Marissa Abbott; Dutch Brennan, Altoona Area School District board president; and Charles A. Prijatelj, AASD superintendent. 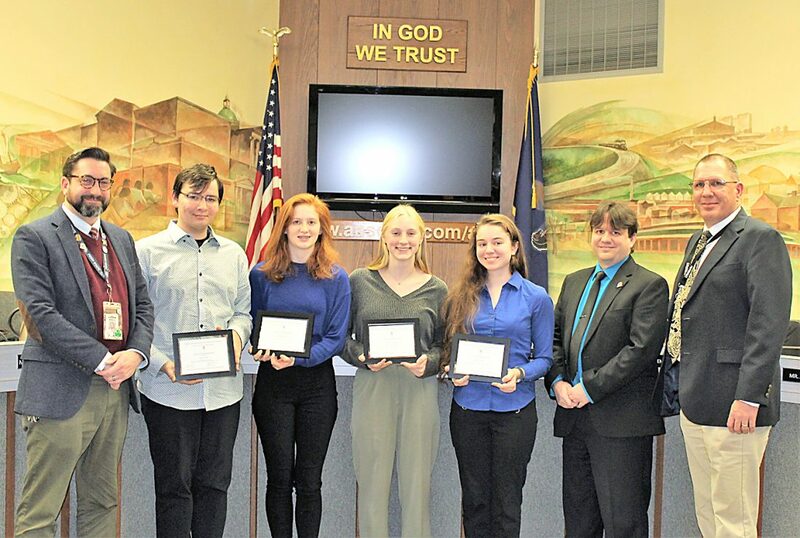 The Altoona Area School District Board of Directors recognized four Altoona Area High School students at the Nov. 13 school board meeting for being named a Commended Student in the 2019 National Merit Scholarship Program. AAHS seniors Marissa Abbott, Regan Baker, Devyn Freet and Rachel Krier placed among the top 50,000 scorers of more than 1.6 million students who entered the 2019 competition by taking the 2017 Preliminary SAT/National Merit Scholarship Qualifying Test. About 34,000 students throughout the nation are being recognized.